Definition > Fallopian tubes - Uterine tubes. The Fallopian tubes are part of the female reproductive system. 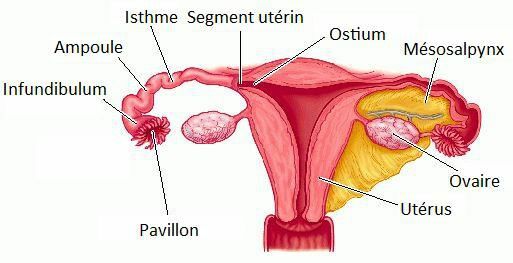 The Fallopian tubes are located between the ovaries and uterus. Their role is to carry ova produced by the ovaries, to the uterus each month. The ova are transported to the uterus along the Fallopian tube for approximately six days, pushed by epithelial cilia. Their progress is determined by movements of the fallopian tube and the mucosa. Fertilisation takes place during this transport process. The Fallopian tubes lie on each side of the uterus. They resemble two horns of a ram ending in a wing and are composed of a single ciliated cylindrical epithelium. The Fallopian tubes are approximately 12 to 15 centimetres long and 1 centimetre in diameter in their narrowest areas, rising to 3 centimetres in diameter in the wings. They have muscles on their outside, which pull the wings towards the ovary during release of the ovum (to recover the ovum).